distribution Statewide, occurring in all 100 counties. abundance Very common to abundant across the state, not seeming to vary considerably in numbers from one province to another. Though seldom occurring large swarms -- the highest one-day count is "just" 55 individuals -- it is among the most widespread species in terms of habitats from wet to dry, wooded to open. flight Nearly the entire odonate flight season, from late March to late October, sparingly into November. habitat Ponds, lakes, swamps, seeps, pools, and other open water. Probably uses smaller, temporary pools and ditches more than most other dragonflies. behavior Adults commonly perch flat on the ground, especially on mud or other damp ground, such as pond shores, muddy spots in powerline clearings, and so forth. 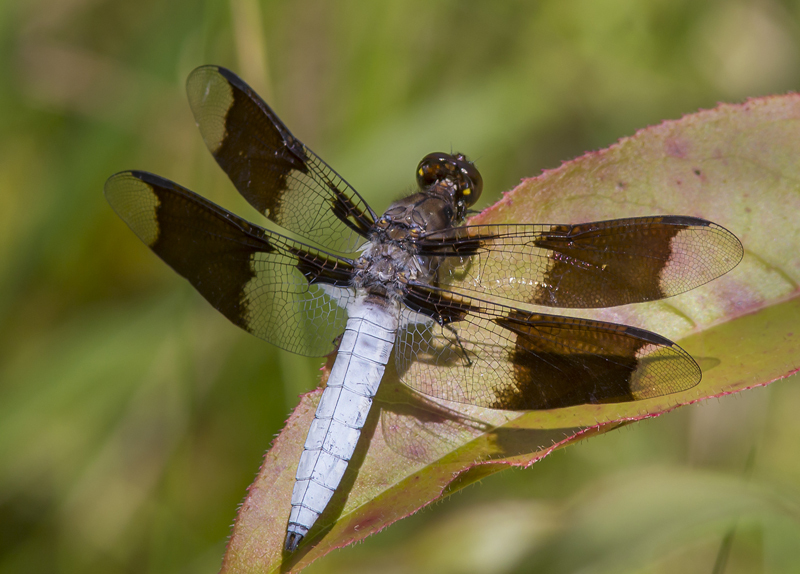 They also perch more often on concrete, wood, and other man-made structures than do most other dragonflies. They do perch on twigs and vegetation, but not as frequently as do most other skimmers. They forage well away from water, in fields, woodland borders, powerline clearings, as well as at pond margins, etc. ; they often come into urban habitats such as gardens and yards. comments This may be the most conspicuous or obvious dragonfly in NC, especially to the layman; they are impossible to miss or overlook when present, as they perch on the ground where observers frequently walk. In fact, one quickly tires of them, despite their attractiveness. Though females could be confused with the scarce Twelve-spotted Skimmer, in general this a very easily identified dragonfly.